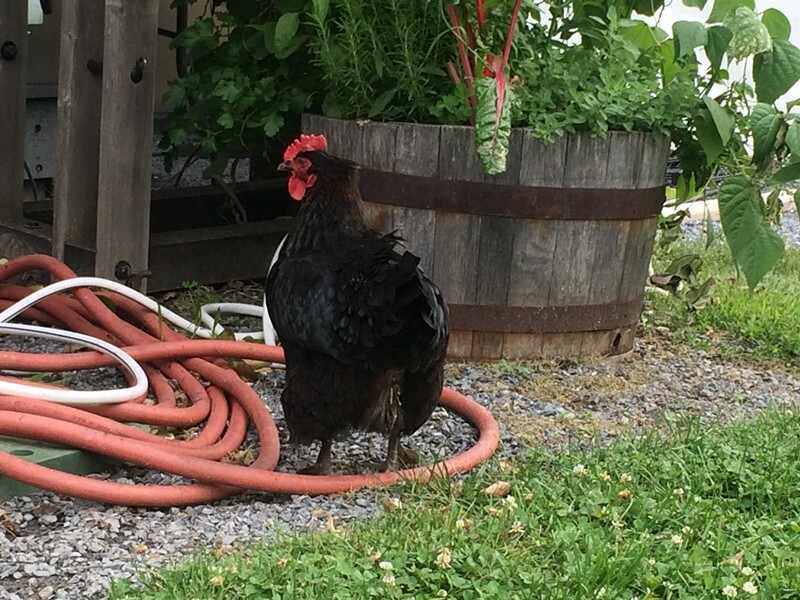 Sometimes, you feel like brunch at Shelburne Farms. But that craving can't be satisfied last-minute — reservations are necessary well in advance. And not all of us want to pay $14 for a veggie hash, anyway. Luckily, there's a lower-cost but equally ultra-local option. 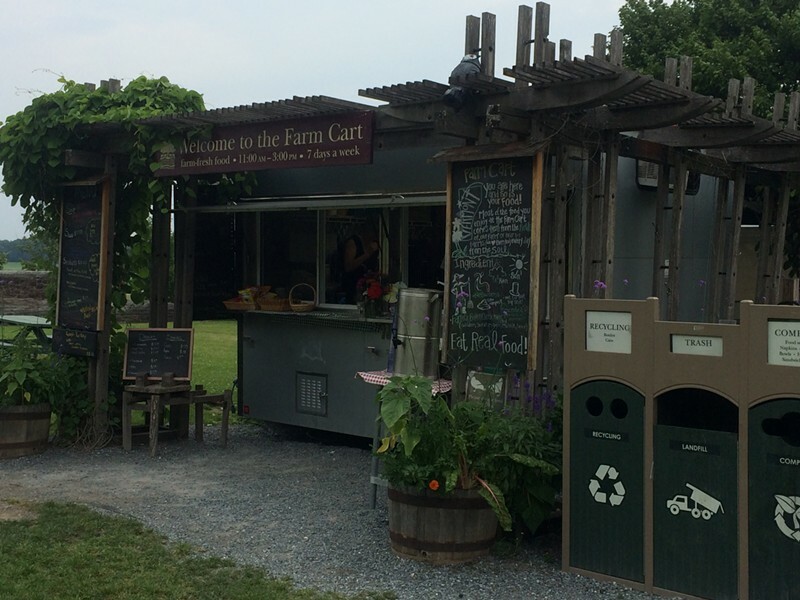 In front of the Farm Barn, a food-truck-style set-up known as the Farm Cart offers a menu of sandwiches, salads and soup. And since seating is at gnarled wood picnic tables in an open field, you may be joined for lunch by a chicken or two, as I was. 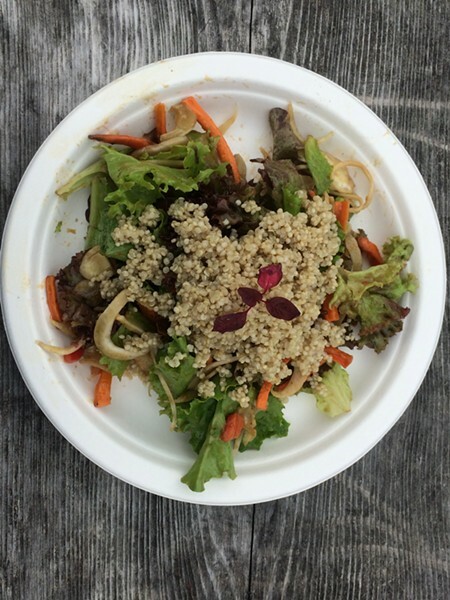 The menu constantly morphs to showcase what's fresh on the farm. This week, the strawberry's the thing. 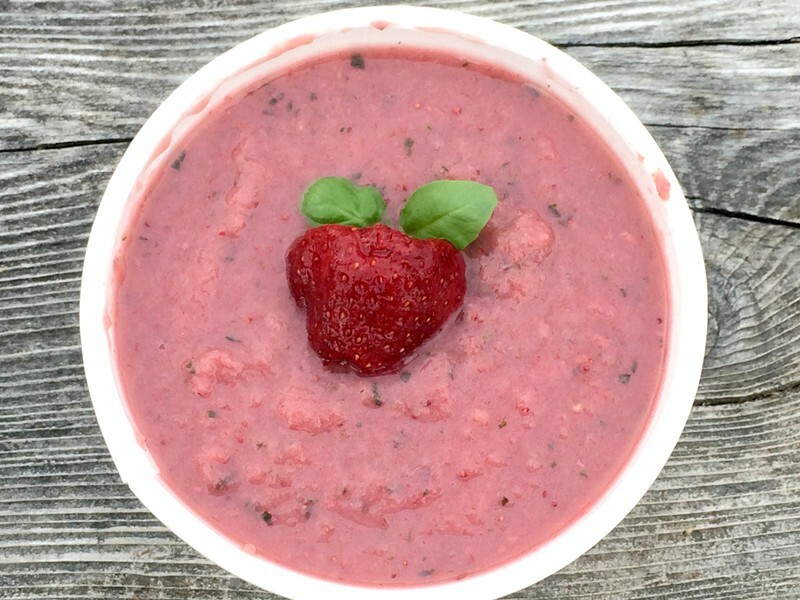 Naturally, I ordered this strawberry soup ($5). Gorgeous, right? Unfortunately, its aesthetic gifts were purely visual. Made without the advantages of a chinois, the big bowl was filled with a bland mash that was by turns lumpy and watery. Even when I tried thinking of it as apple sauce with strawberries in it, it wasn't very good. Though I was tempted by a strawberry-mozzarella salad, I chose a quinoa one instead for variety ($5.50). Roasted carrots and fennel were mixed with the grain and fresh greens. The balsamic vinaigrette that dressed it was pleasant while I chewed the salad, but it left a strangely astringent aftertaste. 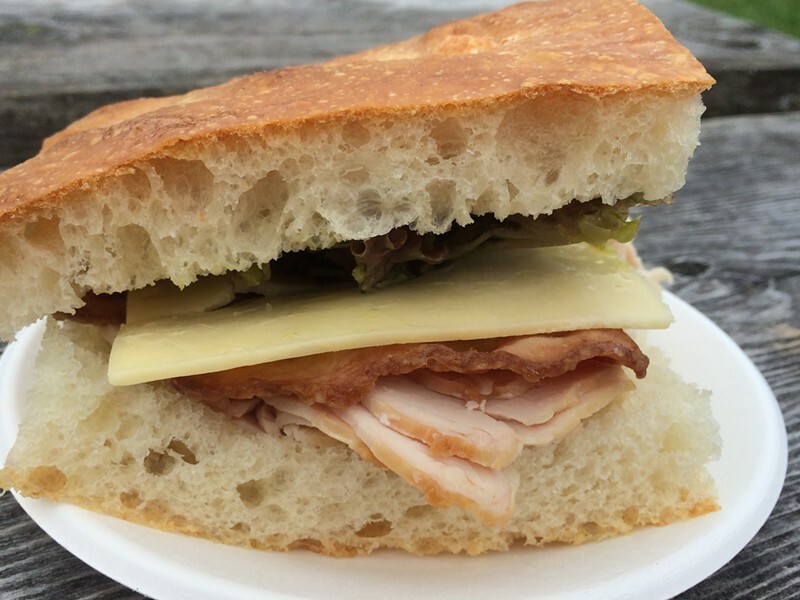 The daily special was a seemingly not-so-special turkey sandwich ($8). That is, until I tasted it. Though not really groundbreaking, the blend of crisp bacon; thick, tender turkey and six-month Shelburne Farms cheddar created something alchemical. A light slick of pesto that soaked into the fluffy focaccia and the greens on top could have been more substantial, but this was a serious sandwich that tasted elementally of the farm where it was made. My one request would be cheese choices — six-month was nice, but a tangy two-year or assertive Tractor Cheddar would be all the better. But even that didn't taste of its terroir as purely as the simple beef burger ($8). Served on foccacia made just feet away at O Bread Bakery, the burger was nothing but a lightly charred patty dressed in house cheddar. The farm's beef was the star. Though cooked by default to something like medium-well, it oozed red juice all over its white paper plate. The lightly sharp cheese added an extra hint of the earth that was just below my feet. 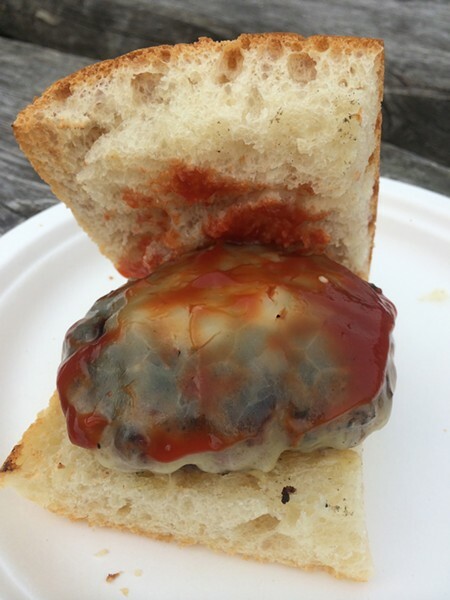 I almost regretted adding a layer of ketchup, which seemed obtrusive among the natural flavors. Followed by a walk through the petting zoo (my lunch's family! ), cheesemaking facility and O Bread, I was lucky to enjoy a casual master class in where my food came from. And that's worth a taste on its own.